There are more than 3 Million Apps and Games on the Google Play Store available for you to download. And apart from just Apps and Games, you can also download e-Books, Music and Movies on your Android device. The Google Play Store is the perfect place to download games, apps, movies, music and books. But not all the good things come for free. There are various Apps and Games on the Play Store which are free to download. But still, there are a bunch of quality Apps and Games for which you have to pay before you can download. I am not saying that all those free apps and games are poor in quality (take Asphalt 8 for example). And also I am not saying that all those paid apps and games are high in quality. But there are a bunch of paid apps and games which is worth every penny (take Grand Theft Auto: San Andreas for example). Now, what if I tell you that you can get any of the paid apps or games or books or music or movies absolutely free through Google Play Credit? And that too LEGALLY. It’s not your fault if you don’t believe me. There are tons of apps on the Play Store which claims to give you free google play credit if you do a particular task like watching a video or installing an app. There are apps which do give you credit but it has a threshold limit, which you have to reach before you can ‘Cash-Out’ your rewards. And those limits are next to impossible to reach. Also, there are a few apps which don’t even show that you earned google play credit even after carrying out the task. These kind of Apps are bogus. Please do not fall for these apps because it takes forever for you to actually get some reward. How to Get Free Google Play Credit? Thankfully, there is an app on the Play Store through which you can earn Free Google Play Credit for REAL. And that app is Google Opinion Rewards. 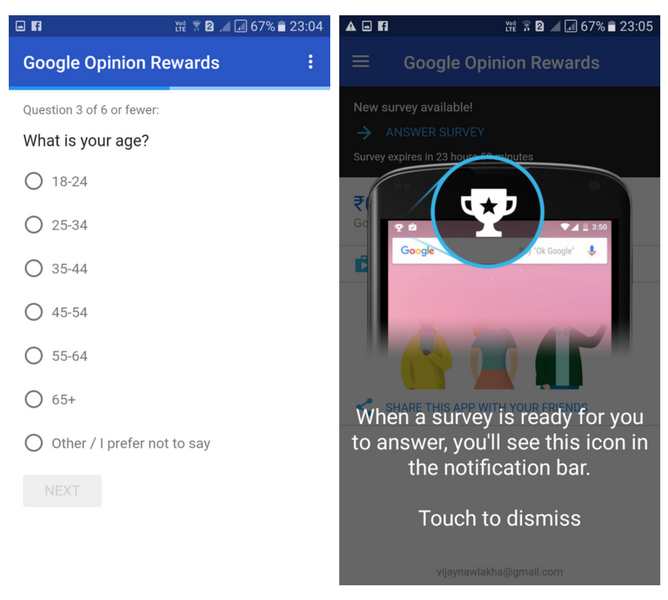 Google Opinion Rewards is the best app for you if you want to get Google Play Credit for free. You don’t need to watch any video or install any app to get credits. All you need to do is Answer a quick Survey. You just have to give your opinion and ta-da! You earned Google Play Credit for free. All the questions of the survey will have multiple-answers from which you can pick any answer which you think is best. And that’s it. Which of the following Google Products have you used in the last 30 days? How was your experience using that Google Product? How likely are you to recommend that Google Product to your friends? A survey has only around 3-4 questions. 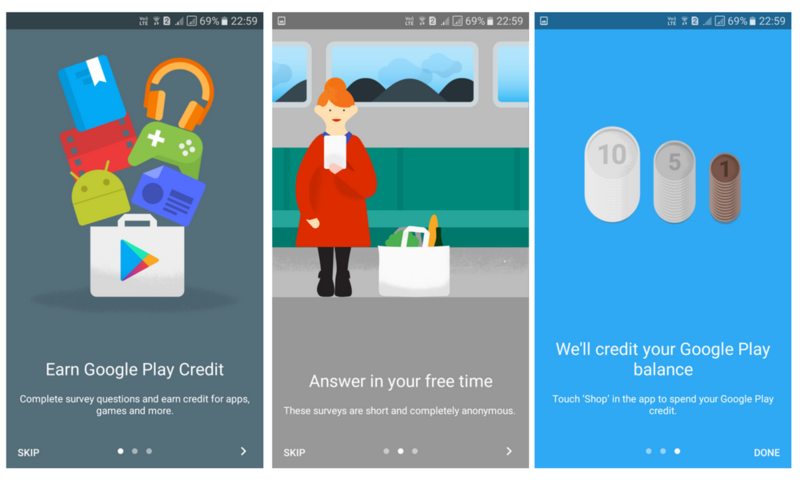 And once you’ve given your opinion for all the questions of a particular survey, you’ll be given Google Play Credit for Free instantly. 2. Once the download is finished, launch the app. Quickly go through the introductions and Set up the app. 3. During the Setup, the app will ask you a bunch of personal questions. Answer them Honestly. 4. Once the Setup is complete, you will have to go through a sample survey. Its only motive is to make you understand how Google Opinion Rewards work and you won’t be given any credits for that. The app is ready now. Now, all you need to do is wait for a new survey. Generally, you’ll get a survey once in every five or six days but there are some people who have witnessed more frequency. Through Google Opinion Rewards you can earn anything up to $1 from a single survey. The app is available for iOS users too. The only difference is that instead of getting Google Play Credit, a small amount will be transferred to your Paypal Account. There are complaints from a few users that they have not received any surveys yet or they are receiving very few surveys. If you are one of those, you can follow the following tips to get more surveys and earn more. Turn the Location on of your device and put it to High Accuracy Mode. 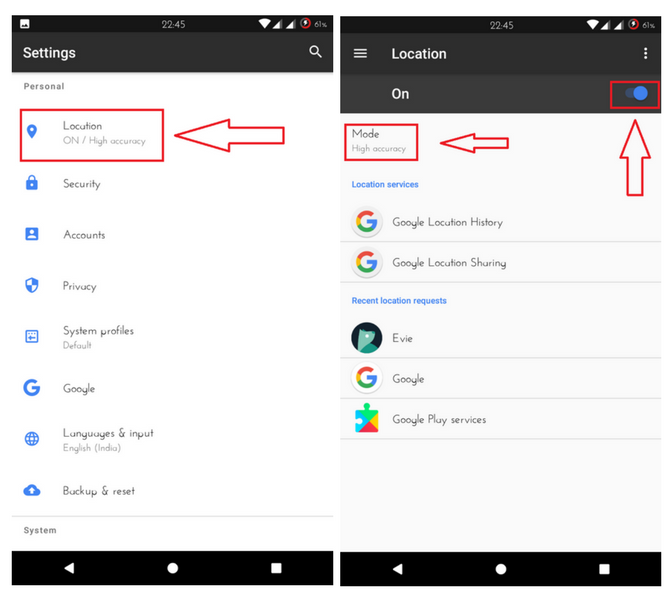 Turn on Location History of your device. 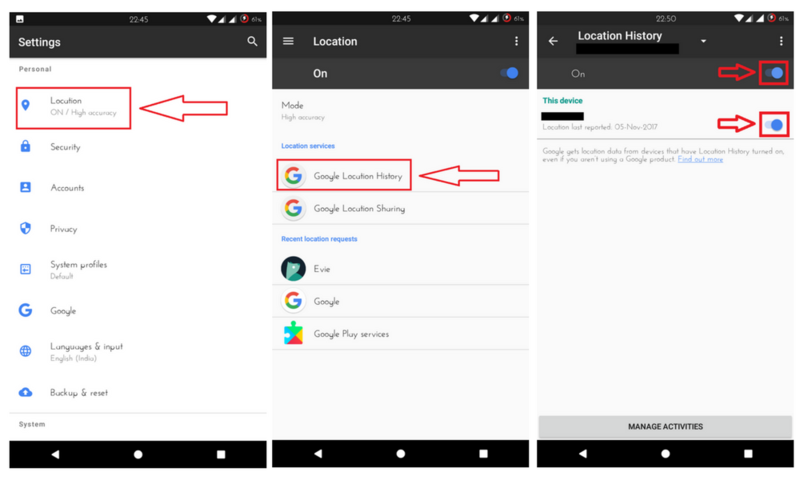 You can do that by heading over to your phone’s Settings >> Location >> Google Location History. Turn it ON. With your Location and Location History on, visit more places in your city. You might find a survey, regarding your visited place, waiting for you at the end of the day. There you have it guys! 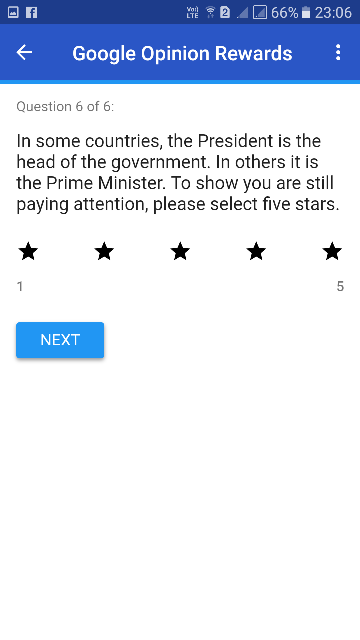 Go ahead and download the Google Opinion Rewards from the Play Store and get free Google Play Credit. It’s a great little app. Highly Recommended! What are your thoughts on Google Opinion Reward? Are you using it? 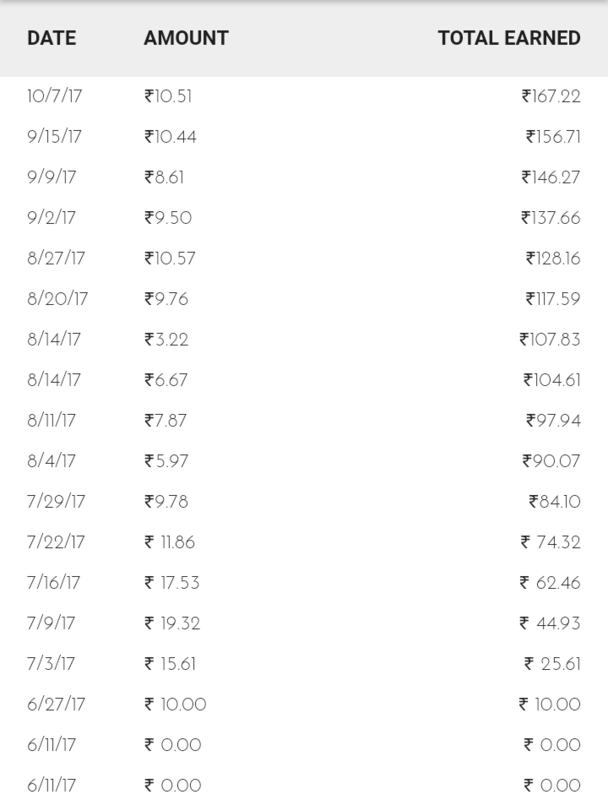 How much have you earned till date? Let me know in the Comments section below! And don’t forget to share this article about this interesting app with your friends and colleagues on your Social Networks.